“The Ohio Action Coalition is one of 50 state-based coalitions working to implement recommendations from the Institute of Medicine’s 2010 report, The Future of Nursing: LEADING CHANGE, ADVANCING HEALTH. The Ohio Action Coalition is co-led by the Ohio League for Nursing, a constituent of the National League for Nursing, and the Ohio Hospital Association, representing the more than 220 hospitals and health systems across Ohio. A number of other health care organizations and individuals, each committed to the strength and success of nursing, serve on the OAC’s steering committee and workgroups” (http://www.ohioleaguefornursing.org/page/OAC). 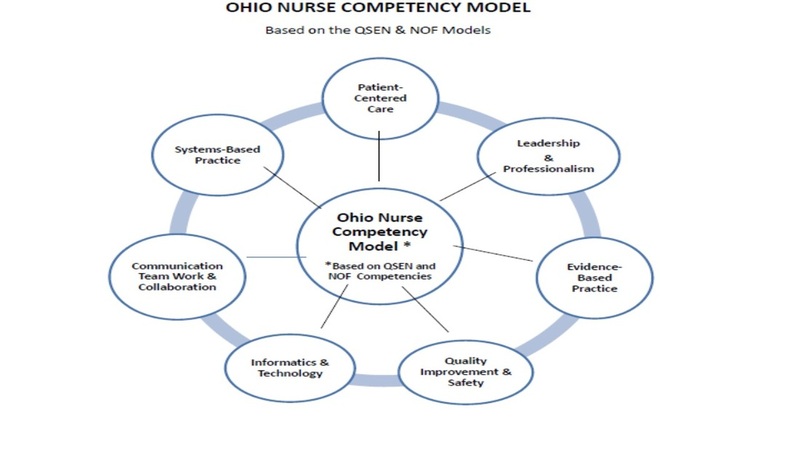 The development of the Ohio Nurse Competency Model provides academic and practice institutions the opportunity to integrate the core competency expectations into both the classroom and clinical settings. Collaboration between academic and practice partners in the development of core competencies has defined the minimum practice expectations of healthcare organizations and schools of nursing in regards to new graduate nurses. The Northeast Ohio Nursing Initiative, NEONI, is a collaborative effort of Northeast Ohio nursing leaders from both practice and academia. NEONI provides the opportunity to bring nursing leaders, clinical agencies, educators and organizations together to address and seek solutions for healthcare workforce issues in Northeast Ohio. This initiative allows for the unique opportunity for nursing leaders to interact with their colleagues from academia and practice, a collaboration that did not previously occur in this region and that is absent in many other communities across the country (http://www.chanet.org/WorkforceNEONI/Membership/OurMembers.aspx). Visit the Ohio League for Nursing website for more information.